BlackBerry selling Limited Edition Gold BlackBerry Passport | BlackBerry Blast! BlackBerry is releasing a limited edition Gold BlackBerry Passport. 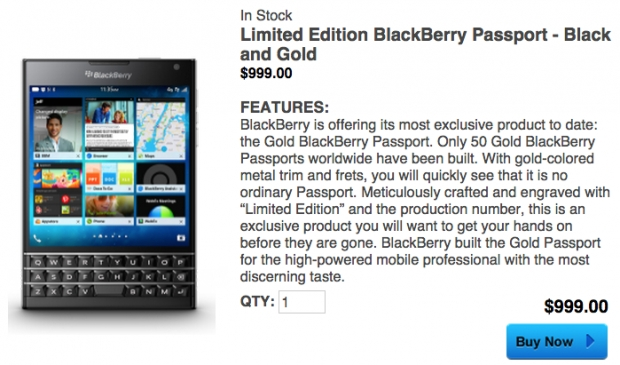 BlackBerry's online store says only 50 Gold Passports were made worldwide. If you think this is a collector's item now is the time to buy it. Be prepared to part with your cash though, because the Gold BlackBerry Passport will sell for $999. BlackBerry is offering its most exclusive product to date: the Gold BlackBerry Passport. Only 50 Gold BlackBerry Passports worldwide have been built. With gold-colored metal trim and frets, you will quickly see that it is no ordinary Passport. Meticulously crafted and engraved with �Limited Edition� and the production number, this is an exclusive product you will want to get your hands on before they are gone. BlackBerry built the Gold Passport for the high-powered mobile professional with the most discerning taste. The Gold BlackBerry Passport features a metal trim and frets. Each device will be engraved with the "Limited Edition" moniker and production number. Will you be one of the 50 lucky owners of a Gold BlackBerry Passport? Hit the source link below to purchase yours now.